I've started working on the Sister Joan shawl that I'm test knitting for Sivia Harding. I've seen no picture of the finished project so it's going to be a surprise as to what it looks like. Now that I have a few repeats of the first section completed the shawl is showing itself and it's a very pretty design - just what I expect from the talented Sivia. Please ignore the color, below, which is totally off. I'm in bad need of photography classes and photoshop didn't help me. 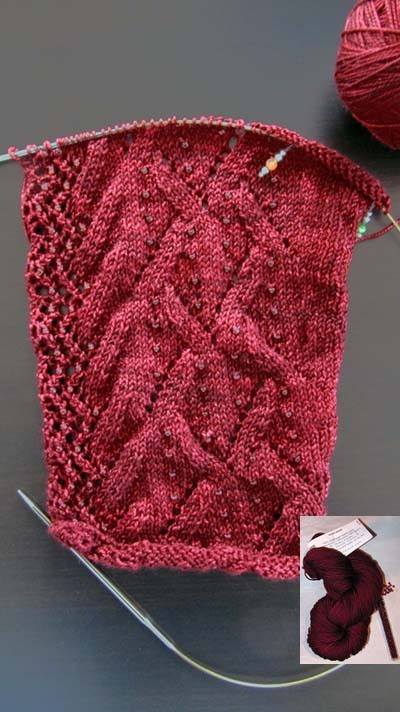 This picture makes the yarn look almost pink but if you look at the inset picture you can see that it's actually a very rich, deep burgundy color. Don't ask me how I managed to take the earlier picture! 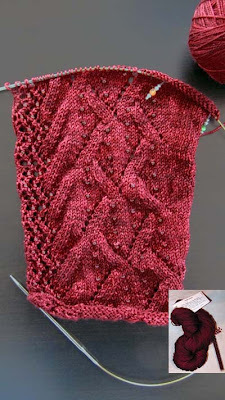 I'm working on the increase portion of the shawl. On the left you can see the lacey edge. There is a textured stocking stitch section in the center, the increase section is between the two markers and a tubular edge is on the right, which you can't see in this photo. The beads are garnet, about the same color as the yarn which gives the design an extra richness. The pattern includes charts and the rows written out. You have a choice. My preference is to work from charts - less reading/more knitting. I'll try to figure out how to take a decent picture next time but, for now, it's back to the fun part, the knitting. I'm almost ready to give up knitting with burgundy or wine because it NEVER shows up right when you photograph it. I tried to get Franklin (Panopticon) to help me get it right during his photography class and even he had to admit it just wasn't possible -- of course with the right equipment (lights, lenses etc) it might just be doable but I think I'll just stick to other colors -- your shawl looks very pretty! Do You Know This Font?